Coordinated and edited by Prof. Savvas Andronikou, this mini-symposium features a series of short commentaries and papers from pediatric radiologists around the world who are active in WFPI or in other outreach activities. In the words of Dr. Peter Strouse, Pediatric Radiology Editor, "As you read, you will be struck by the disparity between wealthy countries, where most of us live and work, and the developing world, where health care resources are sparse and help is needed. These disparities are even more striking if one considers the sheer number of children who live in underserved areas of the world." This mini-symposium aims to expose the readership to the work of WFPI and related outreach activities and convey a greater sense of the needs, the opportunities that exist, the challenges ahead and the accomplishments to date. Above all, this international production reflects WFPI's primary purpose: communication and collaboration between pediatric imaging physicians via their organizations. This is the volunteer-based nucleus driving WFPI outreach forward. We hope our authors fuel its expansion, along with the ever-closer union on which our future work depends. 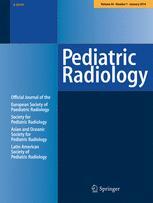 The WFPI extends its grateful thanks to Springer for the opportunity to publish this mini-symposium and to Dr. Peter Strouse and Ms. Patricia Vario of the Pediatric Radiology editorial office, North America, for their unswerving assistance and support.